Our Intro to Aerobatics course is designed for those new to flying or pilots interested in aerobatic training. We want this to be a fun experience you will rave about to your friends and co-workers. Our goal is not to make you sick, but to inspire you to love the thrill of rolling, looping, and sky dancing as much as we do. NOTE: Aerobatic airplanes only have room for the pilot and instructor. The passenger weight limit is typically 200-250 pounds, depending on the instructor. 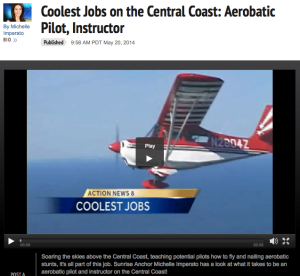 KSBW Flies With Our Chief Instructor! See what your first flight will entail. For thrill seekers and aviation enthusiasts, there is nothing quite like aerobatics. Our instructors having been flying upside down for years and strive to give you the best experience possible. Let them know your comfort level and they will do their best to make it an unforgettable flight! Prices and rates are subject to change without notice. All training and rentals are subject to the terms and conditions in the Renter’s Agreement. Minimum 24 hours’ notice required for cancellation or you may be charged for the rental time.